Criticism of extremist rhetoric and the numerous terror plots that have emanated from Falls Church, Va.'s Dar al-Hijrah Islamic center equals "ignorantly painting all Muslims with the same brush" and "dividing the country using fear and hate," a Virginia state legislator said. 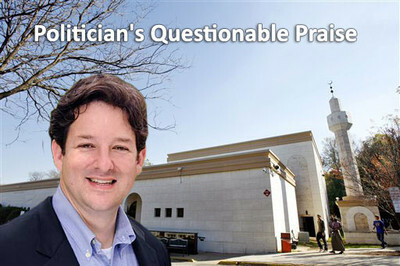 Alfonso Lopez, a Democratic candidate for Congress, slammed Fox News host Eric Bolling for denouncing Lopez's resolution honoring the 30th anniversary of the controversial Virginia mosque. Bolling criticized the resolution because of Dar al-Hijrah's ties to American-born al-Qaida cleric Anwar al-Awlaki and convicted Fort. Hood shooter Nidal Hassan during a March 19 broadcast. "For Fox News to smear an important community institution by ignorantly painting all Muslims with the same brush is reprehensible," Lopez wrote on his Facebook page and in a post on the Daily Kos. "At its core, this is a rightwing media attack on the faith and religious freedom of hard-working patriotic Americans." Lopez created a petition attacking the "right-wing smears of the Dar al-Hijrah Islamic Center" in response to the criticisms from Fox and others. He did not respond to a request for comment from the Investigative Project on Terrorism. The resolution, which passed the Virginia General Assembly March 3, praised the mosque for "promot[ing] cooperation, tolerance and mutual understanding among different faiths." Dar al-Hijrah may engage in inter-faith outreach. But it also has a checkered history in its preaching, in addition to the radical people it has attracted and the terrorists who prayed there. Lopez also downplayed the mosque's established connections with terrorism and extremist rhetoric by playing up the charitable activities and interfaith activities it engages in under the rubric of dawah (Muslim evangelism). "In 2013, the members of the center provided more than $80,000 in assistance to community members struggling to pay their rent, and served 200 families from all faith backgrounds each week through their weekly food bank," Lopez wrote on his Facebook page. That's lovely, but it doesn't erase the mosque's history and law enforcement assessments of it. U.S. Department of Homeland Security reports obtained by the IPT have noted that the mosque "has been under numerous investigations for financing and [providing] aid and comfort to bad orgs and members" and have called it a "front for Hamas operatives in U.S."
Among those bad members, Awlaki served as an imam at Dar al-Hijrah before leaving the United States. Two 9/11 hijackers attended services there, as did Fort Hood shooter Nidal Hasan and terrorist financier Abdurrahman Alamoudi. Meanwhile, radical material continues to be peddled by the mosque. Books the Investigative Project on Terrorism bought during a Dar al-Hijrah's book sale last fall included texts sanctioning hatred and violent jihad against non-Muslims. These books raise questions about the mosque's commitment to tolerance and understanding. · Sheik Yusuf al-Qaradawi's book The Desired Muslim Generation, opines that "Palestine will ultimately be freed and the Jews conquered. The whole universe will be on their side; even trees and rocks will somehow support them by saying: 'O Muslim O Abdullah [slave of Allâh (I)] Here is a Jew hidden behind me come and kill him.'" Qaradawi writes that Muslims who wage violent jihad believe "their religion is so precious to them that their worldly life has become despicable." "They fight in Allah's cause, so they kill [others] and are killed," Qaradawi writes, citing Surah 9:111 of the Quran. · The Last Apocalypse, An Islamic Perspective, written by A.R. Kelani, speculates that the dajjal – Islam's Antichrist – will be a Jew and that "Allah will destroy all religions except Islam." · In Pursuit of Allah's Pleasure, another book purchased at Dar al-Hijrah's sale, slams imams who teach that all religions are equal and says that following "iman" – essentially the Golden Rule – is the only thing that is required. "We need to wage Jihad, for without it the flag of Islam will never he raised and the forces of disbelief will continue to dominate our lives. Jihad is the [m]eans by which we can establish the Caliphate after having removed the disbelieving rulers who have replaced the law of Allah by man-made laws," In Pursuit of Allah's Pleasure says. · The Ideal Muslim Society, by Dr. Muhammad Ali Hashimi, talks about diverting zakat funds, ordinarily used as charity to help the poor, to fund jihad. "The most important of these (other uses for zakat) is jihad for the sake of Allah because the Muslim ummah should focus on conveying its message to the world," Hashimi writes. Radical ideas also come from mosque leadership. The mosque's chief imam, Shaker Elsayed, has repeatedly endorsed violent jihad. Just last year, he spoke at a Northern Virginia high school where he preached that Muslim men would be last in line except if it was for "arms for jihad." "Are we afraid because they may call us terrorists?" Elsayed asked. "You are a terrorist because you are a Muslim," Elsayed said. "Well give them a run for their money. Make it worth it. Make this title worth it, and be good a Muslim. "Be a good Muslim who fights back when there is an attack on yourself, on your community, your society, your nation, your religion, your dignity, your honor, your women, your children or your neighbors." This was not the first time Elsayed has endorsed terrorism. In a December 2002 speech, he took issue with the labels "suicide bombers, homicide bombers, or murderers, or killers." "To decide that this man is a martyr or not a martyr, it is a pure religious matter," Elsayed said. "Nobody who is not Muslim has any right to decide for us, we the Muslims, whose is a martyr or another. We as Muslims will decide that. It is in-house business." Esam Omeish, a former Dar al-Hijrah board member who remains an occasional preacher at the mosque, similarly endorsed violent jihad in an October 2000 speech. In it, he congratulated Palestinian terrorists for "giving up their lives for the sake of Allah and al-Aqsa." In another speech two months later, he praised Palestinians for knowing "that the jihad way is the way to liberate your land." He was the president of the Muslim Brotherhood-linked Muslim American Society (MAS). Dar al-Hijrah belongs to MAS, and MAS has operations on the mosque's property. Omeish reportedly hired al-Awlaki to be the mosque's imam. Dar al-Hijrah's rogue's gallery also includes Abdelhaleem Ashqar, a Hamas operative who is serving an 11-year sentence for obstructing a federal terrorism investigation into the terrorist group's activities. Ashqar, a former mosque board member, helped organize a 1993 meeting in Philadelphia with other Hamas operatives. In November, the mosque hosted Hassan Hachimi, the head of the Syrian Muslim Brotherhood's political bureau. While there, Hachimi condemned the United States for classifying al-Qaida's Syrian affiliate Jabhat al-Nusra as a terrorist group. Preaching hatred and intolerance of non-Muslims has been a longstanding problem at Dar al-Hijrah. For example, a Nov. 12, 2004 sermon by Imam Johari Abdul Malik promised that Islam would become the "first religion in America" and that it would be better to "be a Muslim under these conditions than a kaffir (unbeliever) under any conditions." Sheik Mohammed al-Hanooti, another Dar al-Hijrah imam, also showcased the mosque's commitment to tolerance in a December 18, 1998 where he said, "Just like Allah promises us, he will stand in his promise and the curse of Allah will become true on the Jews. The curse of Allah will become true on the Americans and the tyrannies." There are plenty of mosques in Virginia that engage in interfaith dialogue without sermons and literature promoting jihad and which have not served as magnets for terrorists and their supporters. Pointing out Dar al-Hijrah's full history is neither bigoted nor ignorant. Demanding that people not point out that documented history, on the other hand, appears to be a naked play for political support by a legislator with bigger ambitions than the General Assembly in Richmond. If I may recommend a good book to read that explains the difference between Muslims and Islamist's. It is by M. Zuhdi Jasser Ph.D. The book is titled " A Battle for the Soul of Islam, An American Muslim Patriots Fight to Save his Religion. I am a police officer in Texas and a Muslim and I attended one of his Counter-terrorism seminars for law enforcement officers.He gets into detail about the problem about local mosques and the Imam's that preach hate against our Nation. The author is a very educated person and he has a organization called American Islamic Forum for Democracy (AIFD). The Washington Post has described Zuhdi Jasser as "the most important American Muslim you've never heard of." Alfonso Lopez is a perfect example of an Obama worshiper. Is he so stupid as to think that an Islam takeover is not in the process? Enough is enough! We have an enemy of the United States and it was declared by the Muslim Koran to destroy all infidels that are not Islamic. "Death to America" and "Holy Jihad" against the West are not terms that average peaceful people use. Mr. Lopez, you are nothing but STUPID and a Muslim sympathizer anti American as you obviously are.